What is the Atheist's strongest and most frequently used attack against God? Nathan Jones: We're talking about Atheists. They are people who claim to not believe there is a God. Eric, what would you say is their strongest and most frequently used attack against God? Eric Barger: For a long time they really didn't have something to hide behind and buttress what they believe. Now they've got the Theory of Evolution. With Evolution, their thinking goes, "Why would I want to believe in God? If I believe we were just evolved then I can be my own moral agent and do my own thing." That I think the central key argument that we hear from Atheists, Agnostics, Rationalists, and so on. Nathan Jones: So, their greatest attack then would be against the Creation story in the Bible? Dr. Reagan: That's interesting to me about attacking the Creation story, for as a friend of mine says, "It takes more faith to believe in Evolution than it does to believe what the Bible says?" After all, Evolution teaches that everything came from nothing. Nathan Jones: Nothing plus nothing plus time equals something. Dr. Reagan: Evolution teaches that mankind came from scum on a pond which just evolved miraculously over time into people. Eric Barger: It takes way more faith to believe everything evolved randomly than it is to believe that an intelligent Creator created us. That kind of stubborn, willfully ignorant faith is way, way beyond my understanding. Dr. Reagan: You would think that with the discovery particularly of DNA that this would rock the very foundation of Atheism, because here we're seeing highly complicated programming that could only come from an intelligent being. And yet, it seems like no matter what evidence you produce, Atheists look the other way. Such odd behavior is exemplified in the title of Ray Comfort's book You Can Lead an Atheist to Evidence, But You Can't Make Him Think. Nathan Jones: The Bible tells us about people who deny reality in Romans 1:20, "For since the creation of the world His [God's] invisible attributes, are clearly seen, being understood by the things that are made, even His eternal power and Godhead, so they are without excuse." The scripture goes on to say, "that they made their foolish hearts darkened and that they became fools." Does that mean then, Eric, that Atheists are fools? 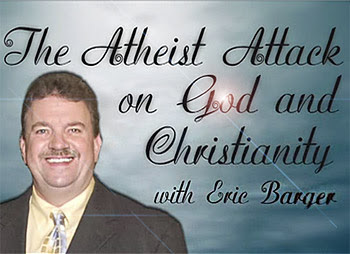 Eric Barger: They want to believe what they want to believe, because if they were to believe there is a God that means they are accountable to someone. If they were to believe what the Bible says, then that means that they have to acknowledge that they are sinners and they need a Savior. For a lot of people, they just don't want to believe in that truth. That would mess up their party, so to speak. When the word "fool" is used in the Psalms it says that, "a fool says in their heart there is not God." That's the word explaining that they are moral fools. They may have some brain intelligence, but that's not the issue. They become moral fools. They decide to be their own moral guide. A man's always in trouble at that point. Dr. Reagan: Yes, I don't challenge the intelligence of Atheists. There are Atheists who are extremely intelligent, but they are spiritually blinded. Whereas, their attitude towards Christians is just the opposite. To an Atheist, anyone who would believe in God is simply a Neanderthal and is a person who just can't think. In fact, one of Atheism's leading proponents, Richard Dawkins, says he doesn't want to be called an Atheist anymore. Amazingly, he said to the effect, "We Atheists got together and we discussed this and we decided we wanted a friendly term like 'gay' for homosexuals. We want something friendly, so we've decided from now on we want the whole world to refer to us as the 'Brights.'" I guess that means you and I are the "Dims." Just think of the implication in claiming that name. Everyone else then is just stupid. Eric Barger: Yes, to Atheists if you believe there is a God, you are therefore stupid. If you believe that we didn't evolve, then you're a problem, even though Evolution is only a theory. Like the late Walter Martin said, "A theory is a magnificent idea ganged up on by a brutal bunch of facts." Dr. Reagan: That's a pretty good quote. I hadn't heard that one before. It's just amazing to me how no matter what evidence you present to an Atheist, it's just isn't going to be accepted by them. We have a member on our Board of Trustees by the name of Dr. James Hugg. He who was one of the youngest Ph.D. graduates in the history of Stanford University and is a brilliant man. And yet, in his Ph.D. oral examination at Stanford, they discovered that he had become a believer while he was there and the school refused to give him his doctorate. They said he was an embarrassment to them and asked him how he could come to the science department and end up a believer. James answered that he began to believe in the Creation from the study of geology. He said that when he looked at the geological record the only thing that made any sense for how it looks was the Noahic Flood. He then started looking at the Creation and the only thing that made any sense from the evidence is that there's a Creator God. His professors were just flabbergasted. Eric Barger: People who haven't read what Dr. Hugg wrote in the Lamplighter magazine January/February 2012 edition need to read his story. I even quoted his article in a debate I had. He gives great evidence. Dr. Reagan: Yes, Dr. Hugg really does in his article give a lot of evidence about the fact that the earth is a young earth. A young earth is the best explanation for what we can see from the geologic evidence. Nathan Jones: How do Atheists undermine the Creation? Eric Barger: They undermine it by saying, "Science says this. Science says this." They keep bringing out science. Nathan Jones: They also back each other up, right? Eric Barger: Not all science says Evolution is an absolute fact, though. But, yes, they'll back each other up with only the science that agrees with their theories and claims there is no God and that we must have evolved into what we are now. Although, the time it took to evolve is a figure that floats around. Today they say we are 4.54 billion years old, give or take. Their time figures have changed several times along the way, which is a big problem with their theory. They still try to back the fluctuating time scales with science. Let me say it again, though, Evolution is all just a theory for the sole purpose of helping men feel liberated from God. Evolution is just as baseless as the theories against the resurrection of Jesus Christ. There are all kinds of theories that help man deny there's a God. It's not that these theories are true, just convenient, temporarily of course. Nathan Jones: The Atheist have pretty much set themselves up as the priesthood of their own religion. Eric Barger: Yes, though I'm not sure I would call them religious. A man becomes his own god whether he says he is religious or not as he has assumed the position of God. Nathan Jones: Atheists have faith in the absence of any real facts, so to me it sounds very much like Atheism is a religion. Eric Barger: Yes, I wouldn't argue with that. In the second segment on why Atheists think the way they do, we'll look into why Atheists are so on the attack against Christianity as of late. If there is no God and no afterlife then our existance is meaningless and that would be the most cruel joke that could ever be imagined. Atheists get to create thier own values and answer only to themselves, they are their own god created in their own image. I speculate that is the appeal to them.